Stamps Galore’s Brownie stamps: “Treed – Hold on!”, “Airborne – Every Which Way but Up!”, “Brownie – What?” are stamped on the right side of this card. 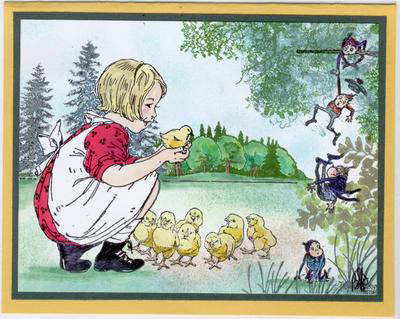 Other stamps used in this card are “Little Girl with the Chick” – Enchanted Ink; “Cluster of Chicks” – 100 Proof Press; “Tree in upper right” – Stampscapes; “Fern” – Rubber Stampede; “Tree Line, Pines, Grass” – Sunday International. Card by Beverly Shupp. Tags: Airborne - Every Which Way but Up!, Beverly Shupp, Brownie - What?, Treed - Hold On!